Oriental Rug Spa offer a specialist Persian, Oriental and Contemporary rug cleaning in Milford. We also offer a rug repair service. If you own a dirty or soiled rug that needs professional cleaning, then why not give us a call on 01276 423150. You can drop the rug into our wash facility or arrange a time for us to collect from you. Pakistani Persian rugs, are as the name suggests, rugs woven in Pakistan in a Persian design. In the late 70s due to the trade embargo between America and Iran, Persian rugs were difficult to come by. 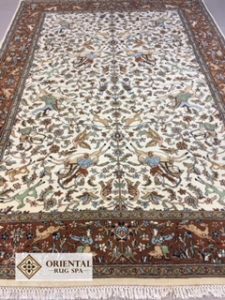 So by producing rugs of a fairly high knot count (approximately 250 knots per square inch) with a Persian design, the gap in the market was filled to a certain extent. Pakistani rugs have a very distinctive knot appearance on the back and also a very soft handle. When new they have a very lustrous pile which shines almost like silk when viewing the rug from one end. Over time the sheen gradually reduces almost without noticing. This sheen and pile softness returns when the rug is professionally cleaned. One issue with washing can be delayed colour bleed from the wefts and not the pile. For this reason it would be a good idea to have the rugs washed by a professional off-site rug washing company rather than attempting to clean the rug at home.